No, Dominica is not the same as the Dominican Republic; Montserrat is a British territory, but the UK can send it help and call it aid; there are a lot of Virgin Islands not owned by Richard Branson: Newcomers among relief workers, more familiar with the Middle East or sub-Saharan Africa, have had to master the map of the Caribbean quickly this hurricane season. From the US territory of Puerto Rico to the tiny half-Dutch, half-French island of Saint-Martin/Sint Maarten, the region is a bewildering collection of languages, economies, and populations. Some are low-income independent nations eligible for aid and concessional finance from institutions such as the World Bank, and some are post-colonial territories, not fully independent and still linked to the UK, France, or the Netherlands. Parallel relief operations are all happening in the same geographic region, but they’re often separate and quite different. The politics of the Caribbean and its various groupings and blocs are also complex and will shape the humanitarian and reconstruction response. National wealth determines which countries are eligible for aid and concessional loans, while membership of regional bodies such as CDEMA and CARICOM can play an important part in reconstruction and preparedness activities. CARICOM – (The Caribbean Community) – a grouping of Caribbean developing countries, not all of which are islands. SIDS – (Small Island Developing States) – a global alliance and grouping used at the United Nations. OECS - (Organisation of Eastern Caribbean States) – an economic bloc, some of whose members have a common currency. ODA-eligible – (Official Development Assistance-eligible) – The richer parts of the Caribbean are not eligible for aid under the rules of the OECD, but developing economies are. This may influence sources and quantities of aid for relief and reconstruction. CDEMA – (Caribbean Disaster Emergency Management Agency) – the region’s disaster management authority, currently leading coordination and response in multiple locations. 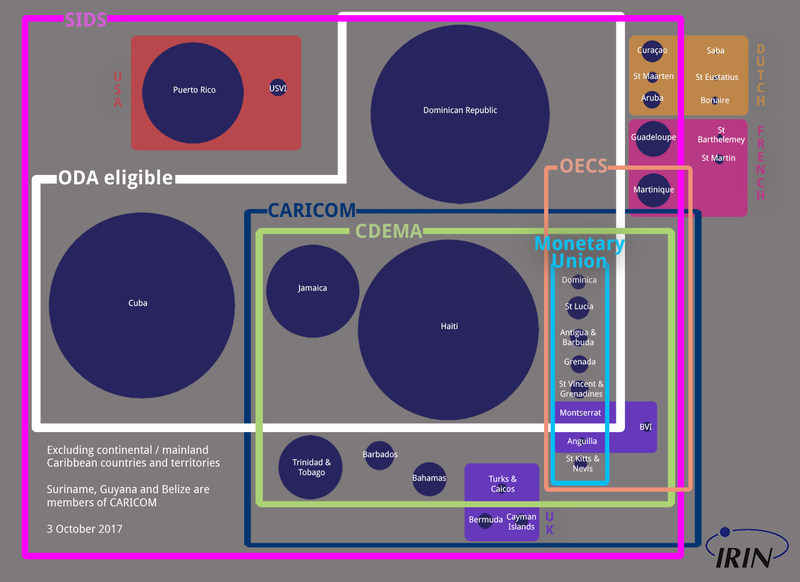 * Revised 28 September to put Montserrat in the ODA-eligible category.